It has been suggested that the sitter is Ludia Webbe (fl. 1788-1812), but it is more likely that she is Mrs Richard Webb, Ludia's mother (see BD 15: 318). 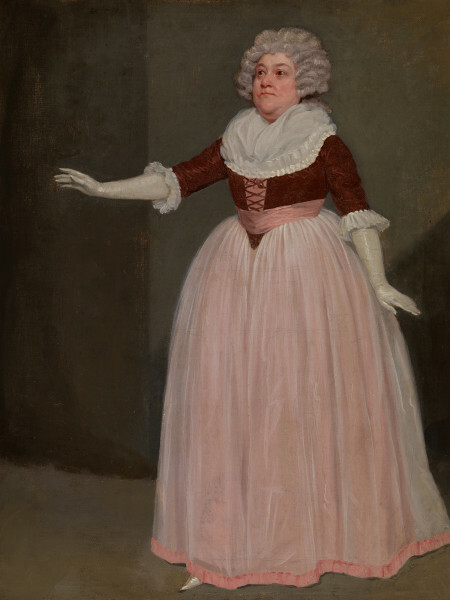 Ludia Webb did not act at Covent Garden (and acted very infrequently in London) in the 1780s. Lady Dove wears long white gloves and a full pink skirt under a gauze, with a purple bodice and pink stomacher and sash. Cumberland's comedy was first performed at Covent Garden on 2 December 1769, with Mrs Green as the original Lady Dove. Mrs Webb played Lady Dove for the first time at Covent Garden on 25 April 1787.